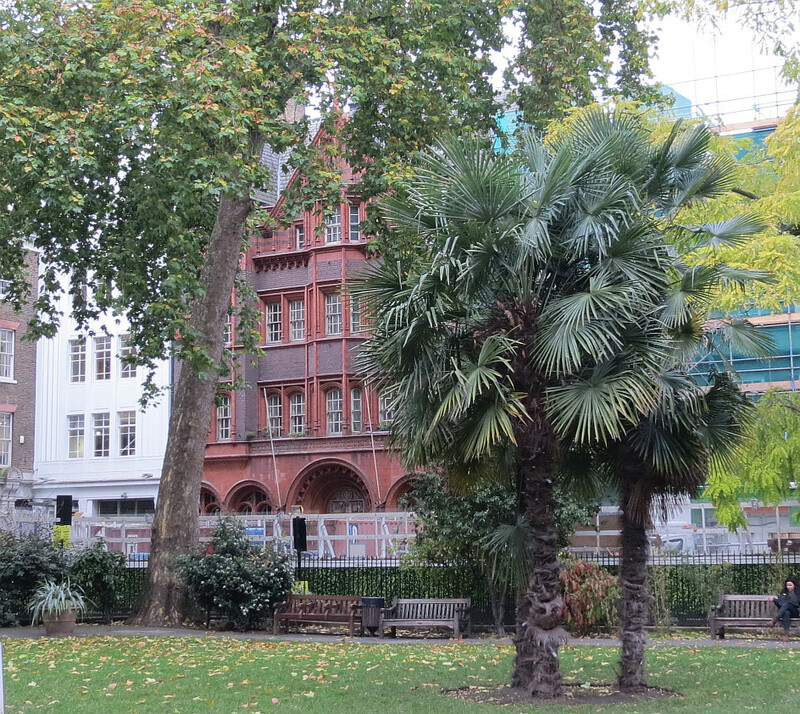 Soho Square, looking south . 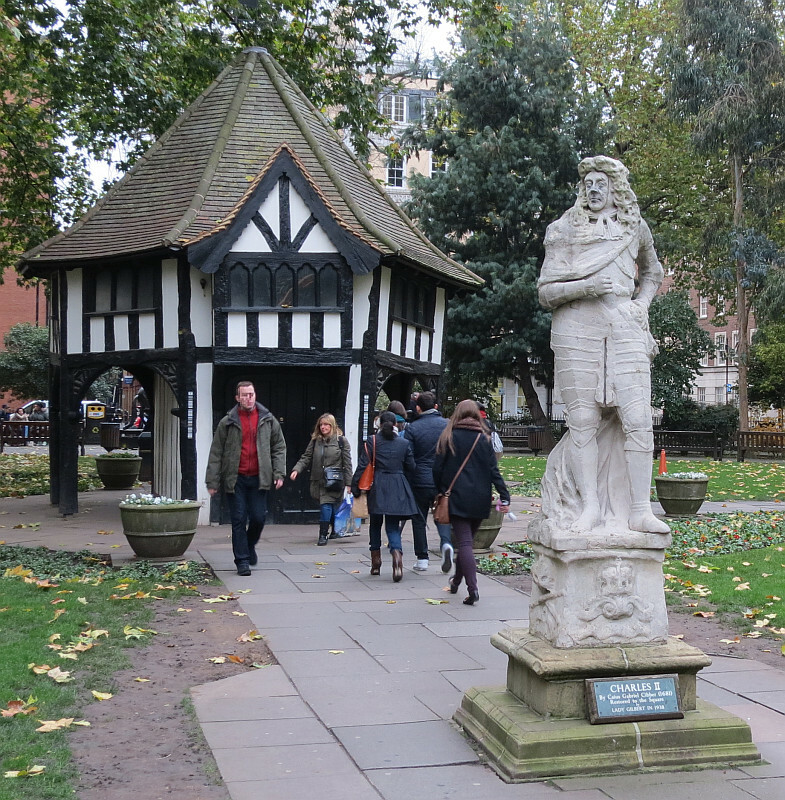 Soho Square, south of the eastern end of Oxford Street, small, low and atmospheric, but for recent building work causing considerable disruption to the ambience, is one of the older London squares, dating from 1681. It is relevant to these pages for its statue of Charles II by Cibber, sculptor of the great panel on the Christopher Wren’s Monument to the Great Fire of 1666. 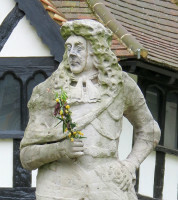 Cibber's statue of Charles II . Let us start with Cibber’s statue. 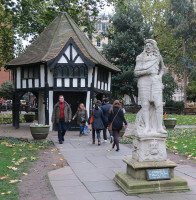 It stands in front of a small Tudor style lodge, and in fact originally was placed exactly where that lodge is now sited, in a fountain on a high base, with subsidiary figures by Cibber representing four great rivers: the Thames, Severn, Tyne and Humber. All this fell into decay gradually, and in the late 19th Century the remaining statuary was pulled down, the lodge put up, and the basins of the fountain were filled in to form the current flower beds. The central statue of Charles II, much damaged, was taken to Grimsdyke, the house of the rich artist Frederick Goodall, and then passed to the next owner, W. S. Gilbert, whose widow returned it to Soho Square in the early 20th Century. At that time it was described as much damaged and without arms. As we see the statue today, it has been made complete, but is extensively worn on the wig and upper body. The King is shown in armour, a cloak draped over one shoulder and down the back, with a flourish at the base in part to support the stone statue. The face, which looks to have been detached and reattached, is likely to have been recarved at least to some extent, and is haughty. A cravat, also probably recarved, is around the neck. He stands with one foot slightly forward, one hand on his waist, and the other across the breast and presumably once holding something; I would think that this arm is probably a replacement, while the other is substantially original. The armour of the legs is likely to have been tidied up somewhat in the restoration. 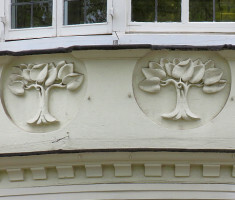 All that survives of the grand base is a short square shaft bearing worn crowns on flourishes; the base below that is of different stone and is presumably from the 1938 restoration. Regardless, Cibber is important enough a sculptor that it is certainly worth examining this work by him. 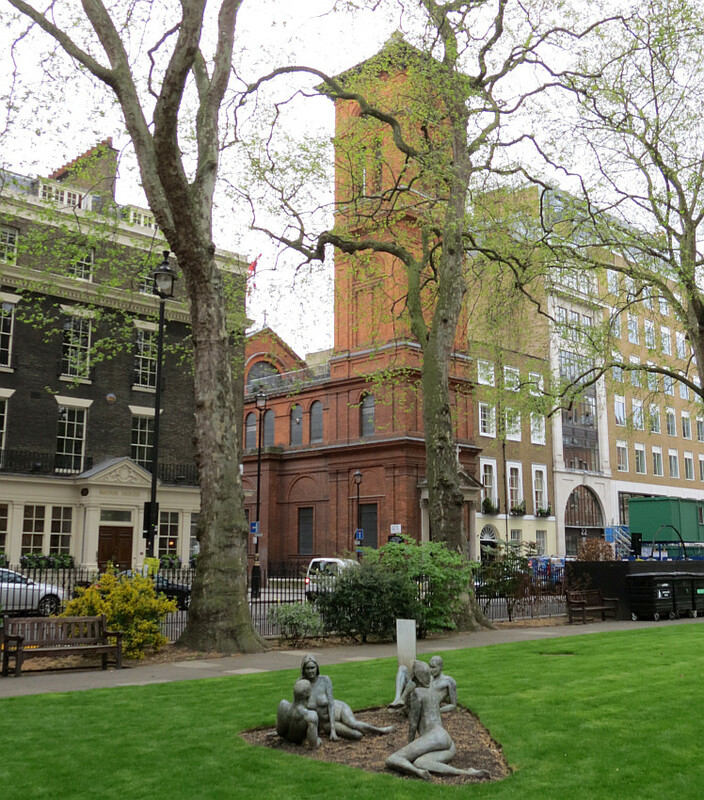 We mentioned above Cibber’s association with Christopher Wren, and he worked at Soho Square too, designing for the south side of the Square the great Monmouth House, for the Duke of Monmouth. When that was pulled down, the Bateman buildings occupied a portion of the site, commemorated in Bateman Street to the south. The street continued to be fashionable into the 18th Century, with Carlisle House built on the eastern side, south of Sutton Street. But by the mid-19th Century the Soho Bazaar occupied the north western corner, a mass of stalls selling women and children’s clothing, and later on it descended to sordid pursuits. But two churches which survive today were put up in the 1890s. 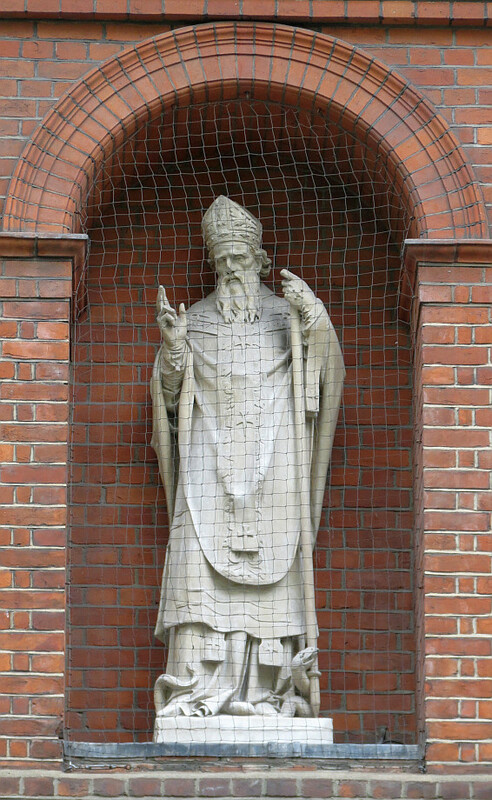 R. C. church of St Patrick Soho, and statue of the saint . First the Roman Catholic one by Sutton Street. Catholics were on the site as early as the 1750s, when part of the Sutton Street side was occupied by the Envoy to the King of Naples, who for a while a chapel here. 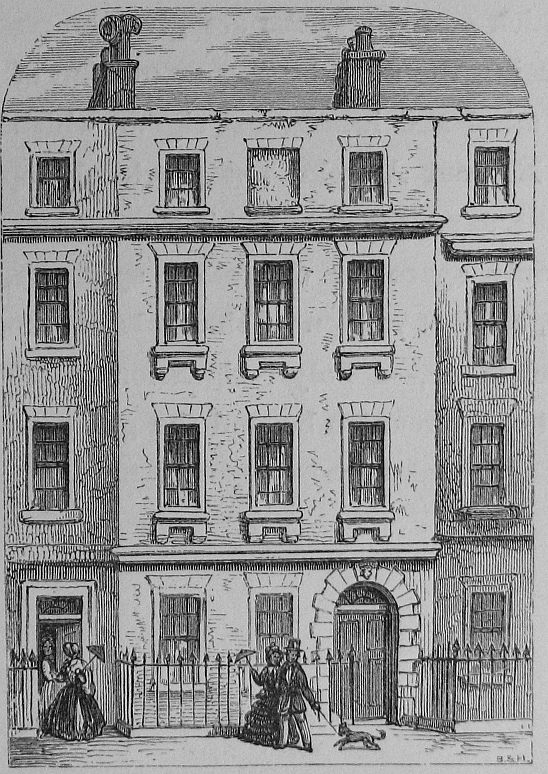 There was a long interregnum, then, during which Carlisle House, only demolished in the 1790s, was held by a certain Mrs Cornelys, who held balls, theatre, and other entertainments there, being accused of keeping a ‘common disorderly house…[allowing]… divers loose, idle, and disorderly persons, as well men as women, to be, and remain, during the whole night, rioting, and otherwise misbehaving themselves’. Anyway, the Catholic authorities, looking to cater for a large Irish population in the area, built a chapel at the back of Carlisle House (i.e. again on the Sutton Street side) in the early 1790s, which was pulled down to make way for the current, larger church. This is red-brick and Italianate, with a campanile tower, is dedicated to St Patrick, and dates from 1893. A niche facing the square contains a presumably contemporary statue of St Patrick, wriggling serpent at his feet, and the modest Corinthian doorway has a pediment filled with Acanthus leaf carved decoration, with crossed keys beneath a Popeish mitre; beneath is the rather assertive motto ‘Ut Christiani ita et Romani Sitis’, or ‘Be ye Christians as those of the Roman Church’. The picture above left, incidentally, shows a modern sculpture by Bruce Denny in the foreground. A glimpse of the French Huguenot Church, by Aston Webb . The second church is almost next to the Soho Bazaar site at 5-6. Nos. 8-9 were sold by a descendent of the Bazaar’s founder to the French Protestant Huguenots in the late 1880s, and they had built the fine building now occupying the site. This Franco-Flemish building, by the architect Aston Webb dates from 1891-3, about the same time as the Catholic church was built. It is coated inside and out in Doulton Terra Cotta. 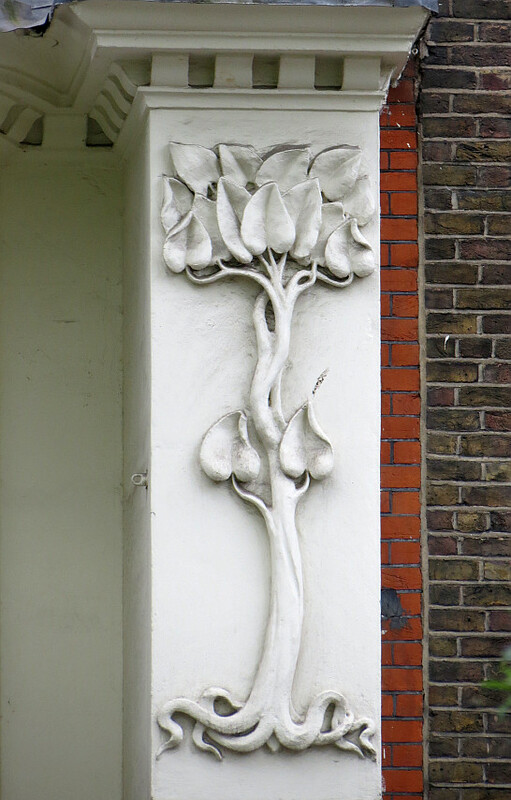 Sculptural detail from Charles H. Worley's building at no. 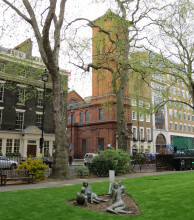 3 Soho Square . Diagonally across from this building on the west side, no. 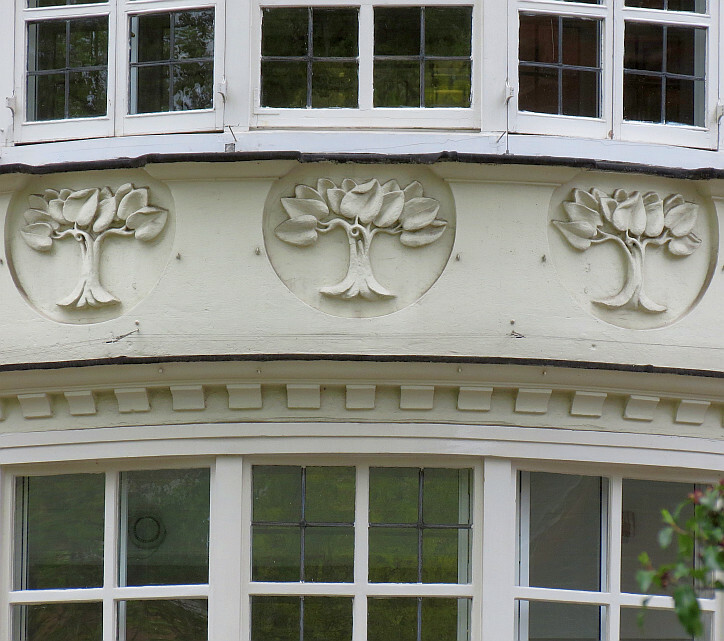 3 by the architect Charles H. Worley has rather nice art nouveau details of uprooted plants and little trees. We might note that no. 2 next to this is one of the older buildings in the square, dating from the earlier part of the 18th Century; nos. 10 and 15 are the oldest, surviving from the very beginnings of the Square around 1680. 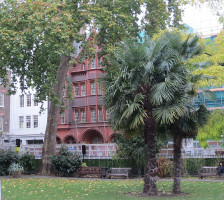 Soho Square is one of those London Squares with exiting roads in the centres of the sides, bar the south side; we have already encountered Sutton Street to the east; to the north is Soho Street leading to Oxford Street; on the south side are both Frith Street and Greek Street; and westwards is Carlisle Street leading to Dean Street, where the important sculptor Nollekins was born. 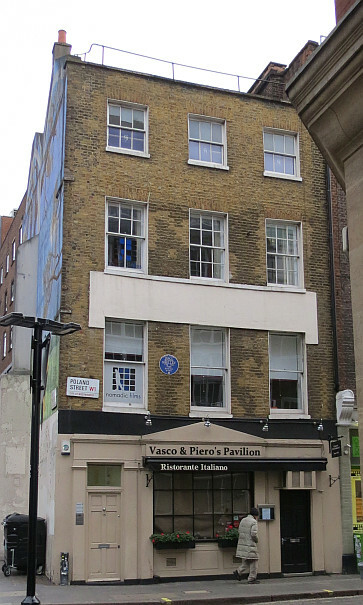 Nollekins' birth place in Dean Street; Shelley's residence in Poland Street .